» Florida is 41-22 all-time against Florida State and currently holds a three-game winning streak over its in-state rivals. UF is 10-6 against FSU under Donovan and 4-3 on the road in Tallahassee. » Four of the Gators’ regular starters are averaging double figures. » Florida has held four of its six opponents to 49 points or fewer. The Gators have only given up 26 points or more in a single half twice so far this campaign. » UF dominated in its season opener, holding Alabama State to just nine first-half points and setting a school record in the shot clock era for fewest allowed in a half. » Florida is 31-1 since the beginning of the 2011-12 season when holding opponents under 71 points in a game. » The Gators were just 3-5 against top-25 opponents last season with all five losses coming to top-three teams. UF is currently scheduled to take on seven top-25 opponents as part of the 2012-13 campaign and is already 1-0 in such games. » Florida is second nationally in scoring defense (48.5 points), fourth in scoring margin (+25.3 points per game) and ninth in rebounding margin (+11.2 per game) and field goal percentage defense (.350). » The Gators are second nationally in fouling, committing 12.5 per game, and 144th nationally in assists, dishing just 13.5 per game. » The Seminoles have 10 players averaging double-digit minutes. » Florida State is 126th nationally in scoring margin (+5.9 points per game) and 167th nationally in rebounding margin (+1.3 per game). » FSU has three players scoring in double figures, all of whom also averaged 5.3 rebounds per game or more. Its top three long-range shooters all hit 41.9 percent or better from downtown. 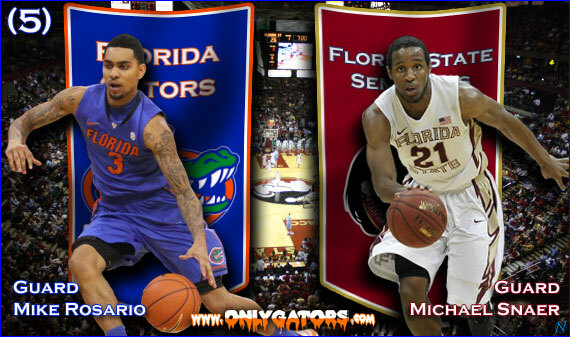 Read the rest of the Florida-Florida State preview…more after the break! Despite suffering a hip pointer against Marquette and not practicing most of the week, senior forward Erik Murphy will play on Wednesday. Though he will not be in his normal spot in the starting lineup, Murphy should come off the bench and see extended minutes as long as he is either productive and/or not in pain. Florida outscored Florida State in both halves on its way to its third-straight victory in the annual series. 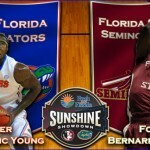 The Gators routed the Seminoles 82-64 behind 15 points and arguably the block of the year by center Patric Young. Bradley Beal led the way for UF with 21 points and was just one of five starters to score in double figures. Florida held an eight-point lead at the break and outscored FSU by 10 points over the final 20 minutes for its 18-point margin of victory. In the middle of a tough three-game non-conference stretch and set to play its first true road game of the season, Florida is looking to win its fourth-straight game against in-state rivals FSU and improve to 7-0 on the young season. The Gators have blown out nearly every opponent so far this year but will be faced with a historically tough defensive matchup in the Seminoles. A victory would also give UF a season sweep of its biggest rival in baseball, football and basketball. » Redshirt senior guard Mike Rosario (#3) had to overcome a lot to join his team’s starting lineup to begin the 2012-13 campaign. He worked hard in the offseason, earned Donovan’s trust and has proven that he can cut down on his turnovers while sharing the ball and finding prime opportunities to slash to the hoop. Though Rosario has not yet reached his full potential, his improvement is evident from a year ago and he is playing 29.5 minutes per game, second-most on the team. His play can go a long way to helping Florida make some major noise this season. Saying that Florida State has had a rough start to the season would be kind. After falling to South Alabama in its opener, FSU rattled off four-straight wins but has since lost consecutive games to Minnesota and Mercer. The Seminoles have a history of taking down highly-ranked opponents at home, and the Gators present a huge opportunity for a team desperately looking for a way to re-energize themselves one month into the season. A victory over Florida would be Florida State’s first since Dec. 7, 2008. » Senior G Michael Snaer (#21) is the star that stirs the drink for the Seminoles. He leads the team in minutes (30.6) and points (14.1) per game and also checks in second in rebounding (5.6). Though he is only shooting 38.8 percent from the field, Snaer has already hit 13 treys on the season and is hitting threes at a 41.9 percent rate. His ability to defend backcourt players, especially shooters, makes him a dangerous counter to Florida’s high-scoring offense. Senior guard Kenny Boynton is in his fourth year as a starter for the Gators. He is quickly making his way up many of Florida’s all-time lists and is already first in school history in three-point field goal attempts (791). He currently leads the SEC in career points (1,676) and three-pointers (275) among active players. Boynton is also approaching the top 10 in games played (16 away), free throws made (43 away) and assists (60 away). FSU’s recruitment of Wiggins during this game is hilarious. Honoring his parents at halftime? Do what you gotta do, I guess.